Automotive loan amounts and monthly payments continue to reach record highs, but US consumers seem unfazed. 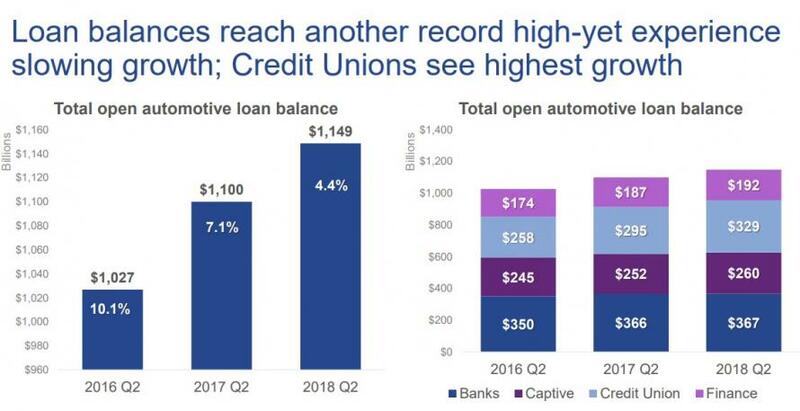 ... with the average new car loan jumping $724 year-over-year to $30,958 in Q2 2018, while used vehicle loan amounts increased $520 to reach $19,708. ... while the average monthly payment for a used vehicle also hit a record $378 per month. "I think we're certainly at a point where affordability is a question," said Melinda Zabritski, Experian's senior director of automotive finance solutions one quarter ago, and the trend has only worsened since. "When you look at how much income you need to support that payment, it certainly is higher than your average individual income." And while one reason people are spending more is because they are buying more trucks and SUVs, which are sold at higher price points, a far more important factor, especially in the last year, is the rise in interest rates. 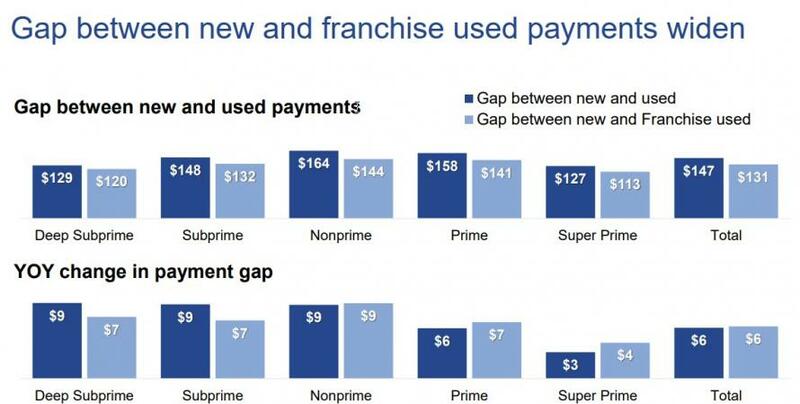 Taking a closer look at the data, the gap between new and used financing payments continues to widen, reaching $147 in the second quarter. For some consumers, that gap can often mean the difference between buying a new or used vehicle. 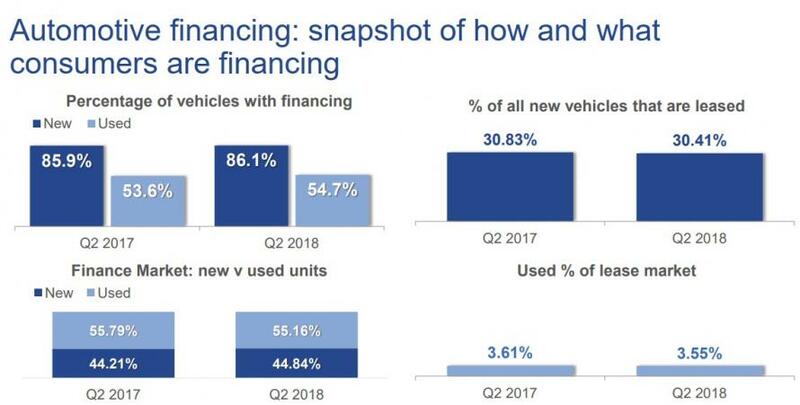 A breakdown of the auto financing market shows that in Q2, 86% of all new vehicles and 55% of used cars were purchased with financing, while the number of leased vehicles in the quarter dipped modestly from a year ago to 30.4%. While hardly a surprise, but further depressing auto affordability, interest rates continued to creep higher across all loan types, with the exception of used loans in the deep-subprime segment where loan issuers have recently retrenched their lending, first in credit cards and now in auto loans, amid fears of a new subprime crunch. The average new car loan is now 5.76%, up 56bps Y/Y, and up from 4.4% five years ago, while the average used car can be had if a consumer can afford the annual 9.40% interest rate. As Edmunds Jessica Caldwell ominously concluded recently, "We're starting to see a trickle-down effect from the rate increases happening at the federal level." Also not surprising is that consumers are staying with a "strategy" of taking out long-term loans, to try and offset higher sticker prices, higher interest rates and higher loan amounts. The flipside is that longer terms mean consumers pay more interest over the life of a loan. The average term in the second quarter was just under 69 months, unchanged from a year ago and tied for an all time high. Experian said, "72 months remains the most common loan term for both new and used loans." 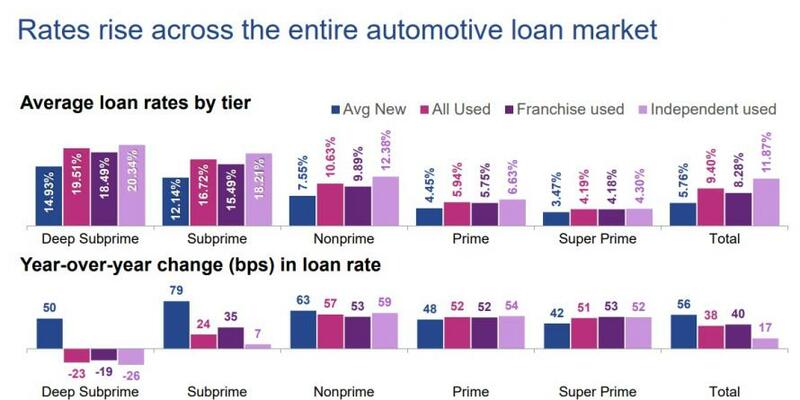 The effect is being felt mostly at the risky end of the credit spectrum, where compared with last year, lenders appear to be more conservative as market share for subprime and deep-subprime automotive loans continues to fall, Experian said. "Deep subprime hit an all-time low of 3.54 percent, compared with 3.98 percent in Q2 2017" Experian sai. 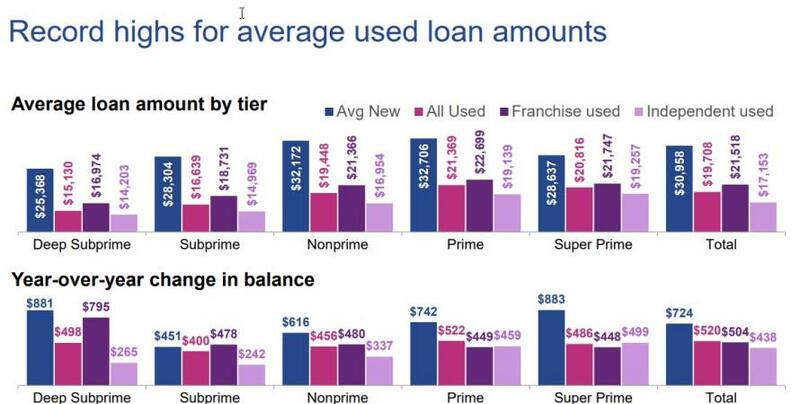 Overall, subprime and deep subprime (a FICO score below 500) fell to less than 19% of the loan market. As a result, average credit scores for new and used vehicle financing continue to improve, reaching 715 and 655, respectively. 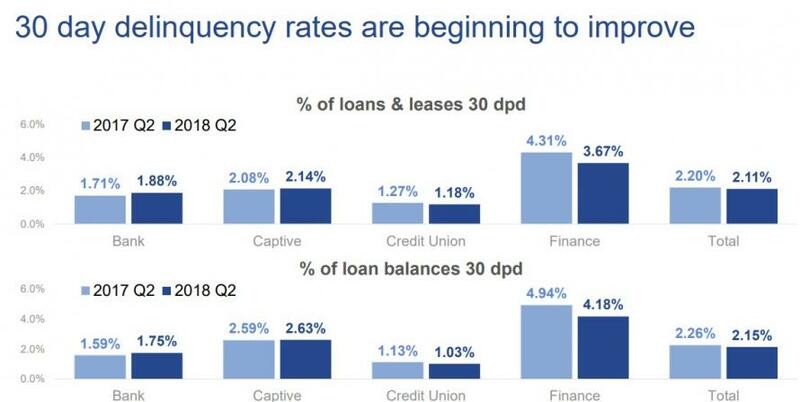 With auto lenders making fewer risky loans, the percentage of delinquent loans showed a decline in the second quarter. Experian reported 30-day delinquencies accounted for about 2.1% of outstanding balances in the second quarter, vs. 2.2% a year ago. 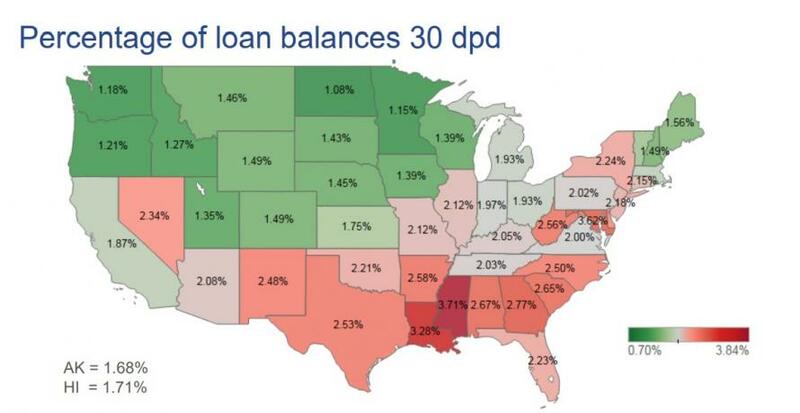 However, as the map below shows, 30-day delinquencies still remain a substantial problem across much of the southern US. 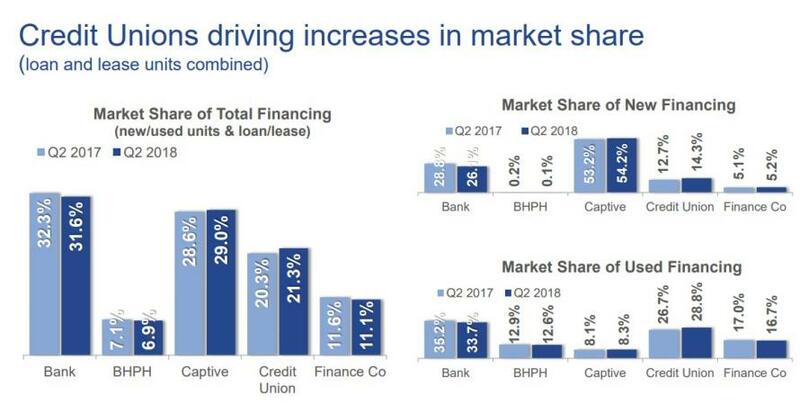 As a result of the pullback on subprime exposure, market share declined in the quarter for “buy-here, pay-here” dealers and for independent finance companies, which tend to specialize in loans to customers with subprime credit. But the key data which seems to suggest that the auto bubble may have run its course comes from the following charts which reveal that traditional banks and finance companies are starting to aggressively slash their share of new auto originations especially when it comes to the subprime segment, while OEM captives (and Credit Unions) are being forced to pick up the slack in an effort to keep the ponzi schemes going just a little longer.